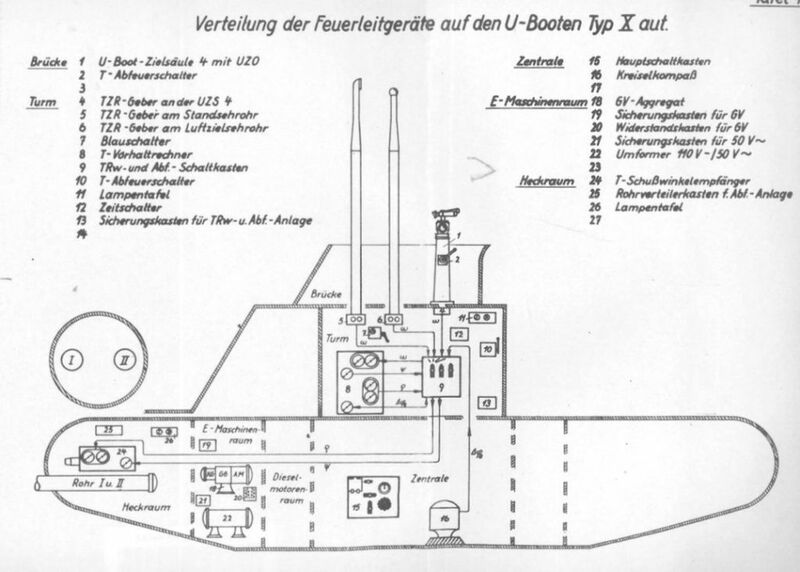 The torpedo fire control system described here is based on the type VIIC U-Boat, which was equipped with four bow torpedo tubes and one aft torpedo tube. 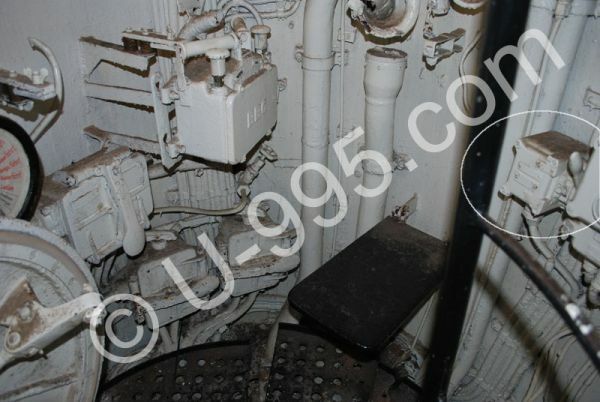 Many photographs were taken on board U 995, now a museum-ship in Laboe and it should be noted that most of the identification labels are not-original and often mistakenly located or mistakenly labelled. This results from double re-labelling (the first time when U 995 was commissioned into the Norwegian Navy and the second time when she was prepared for her role as a museum ship) and in many places one can find labels with Norwegian text because the original German labels were lost. In this document, I recreated the original labels based on the known hardware, which may not always match with the present labels on board U 995. The particular elements of these subsystems are presented in drawing 1. The aiming and target bearing transmitting subsystem automatically transmits up-to-date target bearing data from a selected aiming device (UZO or periscope) to the torpedo data computer. The UZO and both periscopes were connected to target bearing transmitters (Torpedo-Ziel-Richtung Geber). 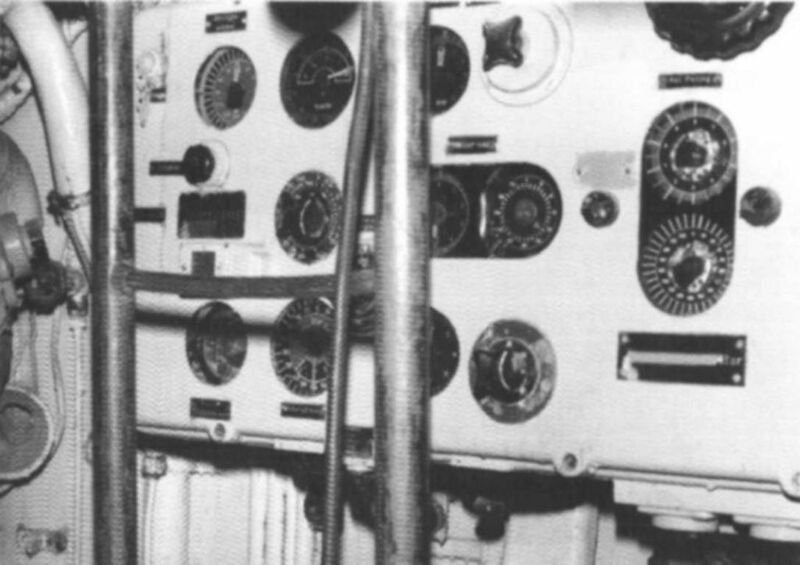 They operated on the selsyn synchro link principle and transmitted the bearing directly to the torpedo data computer. Each target bearing transmitter consisted of two selsyn transmitters in order to achieve better accuracy. First, they transmitted the angle in the range of 0 – 360°, the second – in the range of 0 – 10°. The maximum transmitting speed was 12°/s. 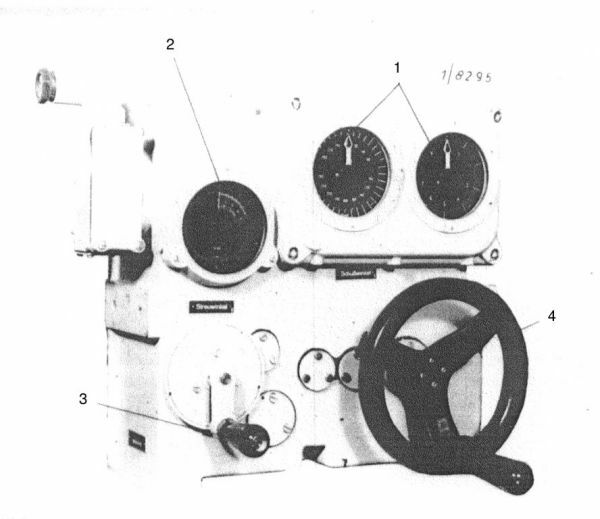 The aiming device (UZO, attack periscope, or sky periscope) used during the attack was selected (connecting the proper target bearing transmitter with the computer) by means of one of the two rotary switches located at the aiming subsystem control box that was installed in the control room (under the chart table). 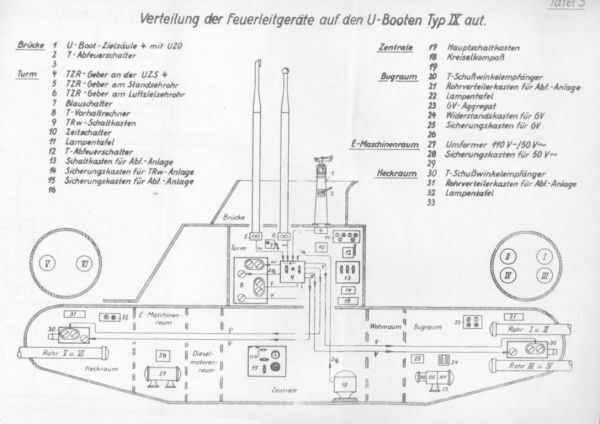 The main part of the fire control system was the electro-mechanical torpedo data computer (Torpedo-Vorhaltrechner) or TDC designed and manufactured by the Siemens Company. 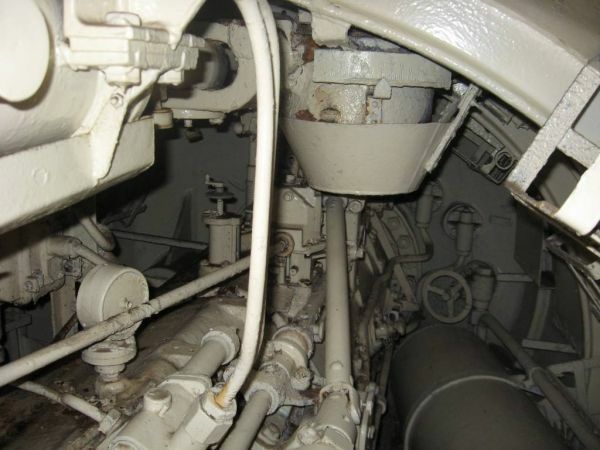 It was located in the conning tower on the starboard side between the helmsman’s station and the attack periscope. The computer solved the torpedo triangle and calculated the gyro angle and the torpedo spread angle. The current target bearing was entered automatically by means of selsyn links, however in an emergency, it could be set manually using the hand-wheel on the TDC. The other data: target speed, angle on the bow, torpedo speed and target length were set manually by means of the hand-wheels on the TDC. 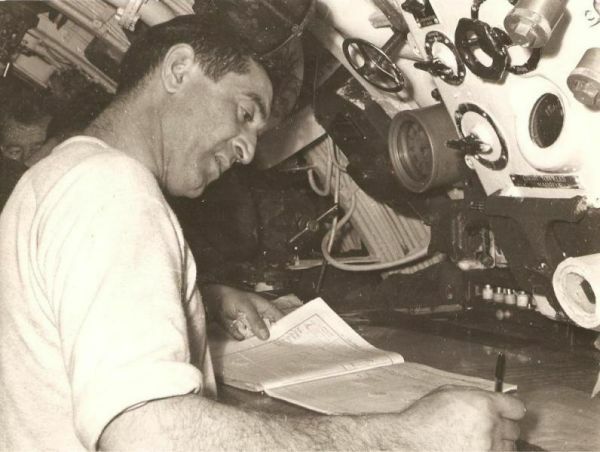 To correctly calculate the gyro angle, the torpedo data computer required the current U-Boat course which was transmitted by means of a selsyn link from the gyro-compass located in the control room. The calculated gyro angle – together with the torpedo spread angle – was transmitted by means of selsyn links to the gyro angle receivers that were located in the forward and aft torpedo rooms. 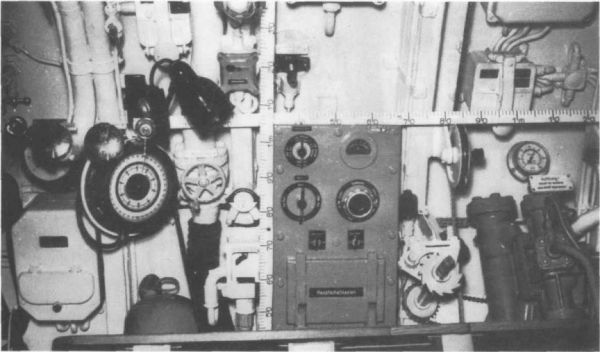 The active gyro angle receiver was selected by means of the right hand rotary switch located on the aiming subsystem control box front panel, which was installed in the control room (under the chart table). The gyro angle receivers in the forward and aft torpedo rooms set - by means of dedicated shafts that penetrated into the torpedo tubes – the calculated gyro angle at the gyro-gears of the torpedoes. 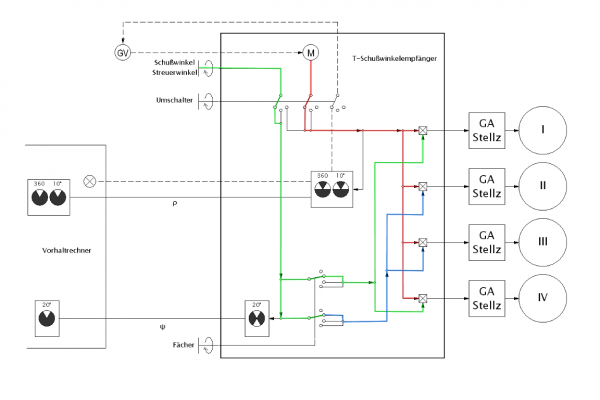 Because the selsyn receiver had not enough output power (torque) to train the gyro-setting gears directly, it was done by means of a servo-gear that was controlled by the machine amplifier (GV-Aggregat), which was located in the E-motor room. two gears, which – depending on the torpedo salvo size selection – provided the following ratios: 1:0,5, 1:1, 1:1,5 and 1:-0,5, 1:-1, 1:-1,5. The gyro angle receiver could work in two modes – automatic and manual. In automatic mode, the angle setting mode select switch was set to the position Streuwinkel von Hand, Schusswinkel automatisch. In this mode, the gyro angle dials created the differential signal between the gyro angle value received from the TDC and the gyro angle value actually set at the torpedoes. This differential signal was presented on the dials by the relative positions of the inner and outer pointers. The differential signal was amplified by the machine amplifier (GV Aggregat) which controlled the DC motor. The DC motor drives the shafts connected with the torpedo tube gyro setting gears. 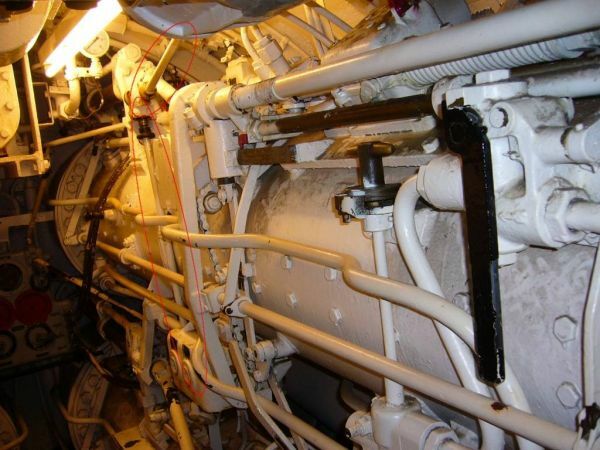 In that way, the whole subsystem sought to minimize the differential signal, respectively turning the torpedo's gyro setting gears according to the value received from the TDC. So the setting DC motor – machine amplifier looked like a servo-motor controlled in a feedback loop. The DC motor shaft was coupled with the shafts of each torpedo tube by four differential gears. Thus the gyro angle calculated by the TDC could be modified by the torpedo spread angle value for each torpedo tube. The value of the torpedo spread angle was entered manually by the hand-wheel. The gyro angle receiver operator trained the hand-wheel until the set torpedo spread angle was the same as the value calculated by the TDC. The torpedo spread angle was passed to the differential gears through two gears with switchable ratios. These gears implemented the multiplication by a constant. Both gears had three ratios: 1:0.5, 1:1 and 1:1.5, but each gear rotated in an opposite direction (that is the output values were the same, but their signs were opposite). The drawing below represents the operation of the gyro angle receiver in the automatic mode when a three-torpedo salvo was selected. The DC motor rotates the differential gears to the value ρ (red). By means of the hand-wheel, the torpedo spread angle ψ (green) is entered, which is passed through one of the two gears (in the three-torpedo salvo mode, its ratio is 1:1) into two differential gears, where it's added to the gyro angle ρ. In the other gear (in the three-torpedo salvo mode, its ratio is 1:-1) the sign of the value ψ is reversed (blue) and passed into the other two differential gears, where it's subtracted from the gyro angle ρ. The final angle between two torpedoes in a salvo depended on the salvo size and for a 2-torpedo salvo was equal to ψ, for a 3-torpedo salvo was equal 2ψ, and for a 4-torpedo salvo - 3ψ. The angle between the courses of particular torpedoes in a salvo also depended on the number of torpedoes and was equal to: 0.5ψ for a 2-torpedo salvo and ψ for a 3 and 4-torpedo salvo. The torpedo salvo size select switch should only be changed when the spread angle was set to “0”. Otherwise, the gyro angles set in the gyro gears of the particular torpedoes would be incorrect. For example: initially when a 4-torpedo salvo was selected, the gyro angle was set to 20° and spread angle to 2°. The gyro gears of the particular torpedoes were set as follows: 23°, 19°, 21°, and 17°. If the salvo size select switch was changed to a single shot (that is gyro gears of all torpedoes intended to be set to 20°), there would be a situation where the current set values were different than values set on the gyro angle receiver. If the gyro angle was set to 30° and the error was not spotted, then the gyro angles set on the torpedo gyro gears would be as follows: 33°, 29°, 31°, and 27° instead of 30°. The proper change-over to a single shot should be preceded by zeroing the spread angle (then the gyro gears of all the torpedoes would be set to 30°). The servo was turned on when the difference between the actually set gyro angle and gyro angle calculated by the TDC was as small as 0.5°. When the gyro angle actually set was equal to the gyro angle calculated by the TDC, the control lamp (Deckungslampe). lit up. When the gyro angle received from the TDC was changing rapidly (with a speed greater than the so-called follow-up speed – (Nachsteuergeschwindigkeit) of the DC motor (which is 2°/s), the current gyro angle is not in alignment with the value calculated by the TDC. 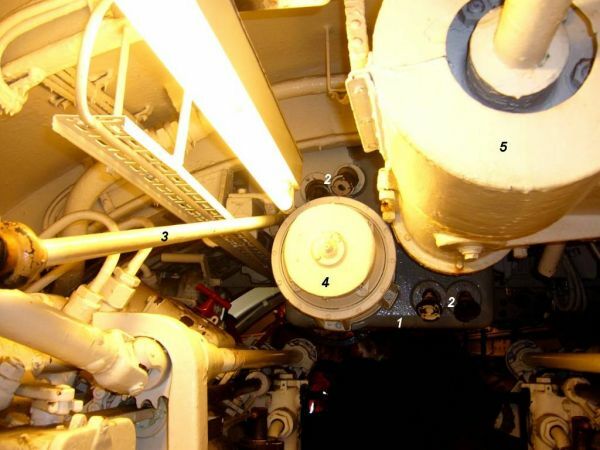 In such a case the control lamp (Deckunglampe) was turned off, so the TDC operator knew that the gyro-angle gears of the torpedoes are not set to the desired value. Simultaneously the speed of the DC motor increased to 2.5 – 3°/s. When the gyro angle calculated by the TDC changed by a large value (i.e. after a target change, the gyro angle could change from 290° to 75°), the gyro angle receiver operator can receive the order to speed up the process of aligning the torpedoes’ gyro-angle gears with the value calculated by the TDC. 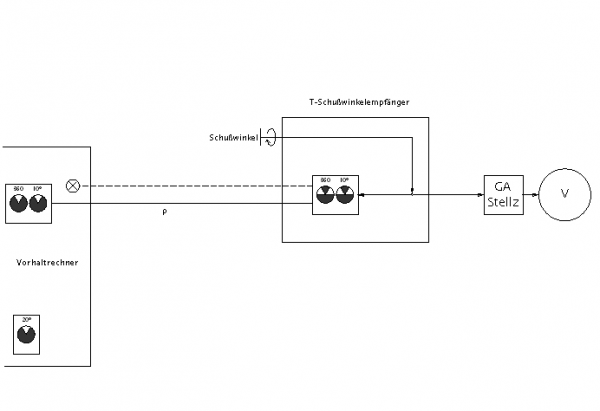 After receiving such an order, the operator set the high setting speed switch – Schnellgang – respectively to the right or left. Then the DC motor ran on the respective side with a speed of 4.5 – 5°/s. The direction to set the high setting speed switch was indicated by two control lamps located on both sides of the switch (left side – red, right side – green). When the actually set gyro angle was close to the value calculated by the TDC, the switch was set in the middle position and the servo automatically completed alignment at a speed of 2°/s. The gyro angle receiver manual mode was used when the DC motor or machine amplifier was damaged or when the link transmitting the gyro angle (and torpedo spread angle) from the TDC to receiver was broken. In such a case, the setting mode select switch was switched to the position Schusswinkel von Hand. The hand-wheel is then coupled with the DC motor shaft. While looking at the dial pointers, the desired gyro angle was set manually by means of the hand-wheel. When only the DC motor and machine amplifier were damaged and the transmission link between the TDC and receiver was operational, the gyro angle calculated by the TDC was visible on the dials. When the transmission link was broken the desired value was passed verbally. When the desired value of the gyro angle was entered, the setting mode select switch was set to position Streuwinkel von Hand (torpedo spread angle manually) and the torpedo spread angle was entered similarly. 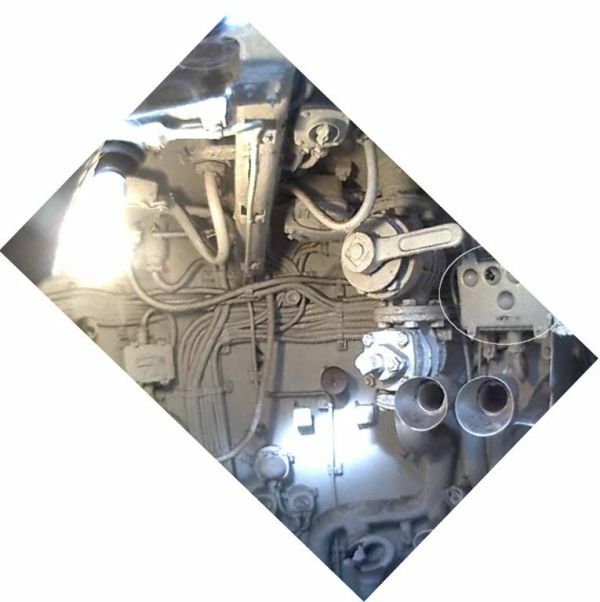 The outputs of the differential gears were connected with the gyro-angle setting gears of the torpedo tubes by means of the shafts. The main part of the gyro-angle setting gear at the torpedo tube was the shaft that was inserted into the torpedo tube through the tube wall. This shaft was inserted into a dedicated slot in the torpedo. While turning, this shaft changed the torpedo gyro setting. 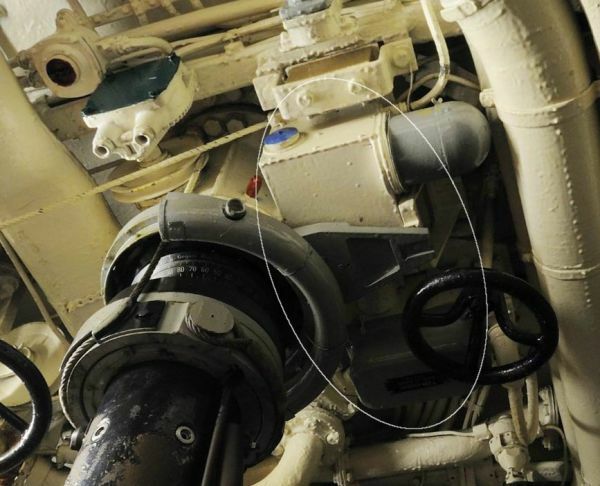 At the moment of the torpedo launch, the shaft was automatically retracted by means of the firing rod, thus the torpedo was not blocked while leaving the tube. If this shaft failed to retract, the result could be a “tube runner” because the torpedo couldn’t leave the tube. 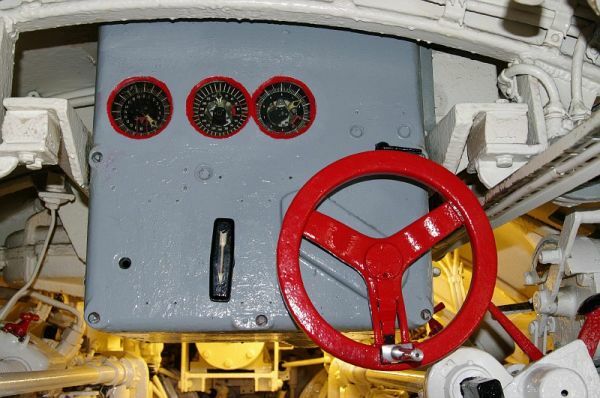 To simplify the system, the servo-motor driving the gyro-angle gears was installed only in the forward torpedo room. The receiver in the aft torpedo room consisted only of the selsyn receiver coupled with the dial and the hand-wheel driving the gyro-angle gear. 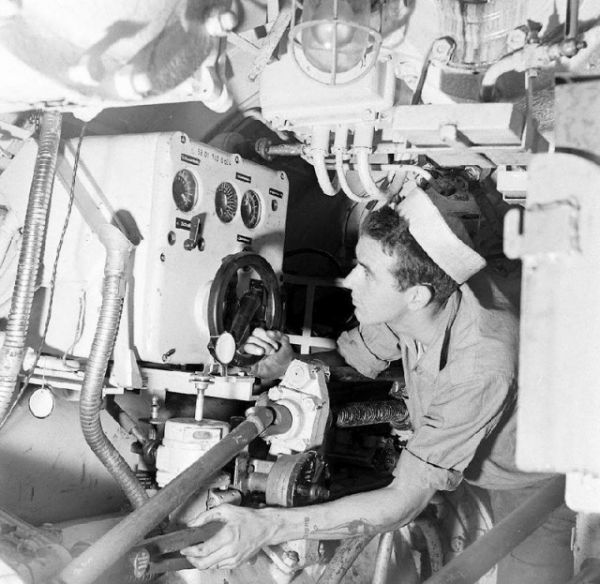 The tube operator observed the dial and manually set the desired gyro angle at the gyro-angle gear of the torpedo loaded into the aft torpedo tube. For the obvious reason (only one tube), the torpedo spread angle was not transmitted to the receiver installed in the aft torpedo room of the type VIIC U-Boats. 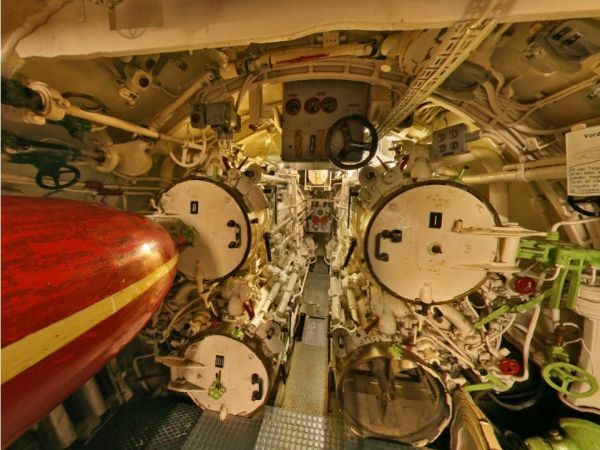 The torpedo firing subsystem was responsible for remotely launching torpedoes from the bridge or conning tower. 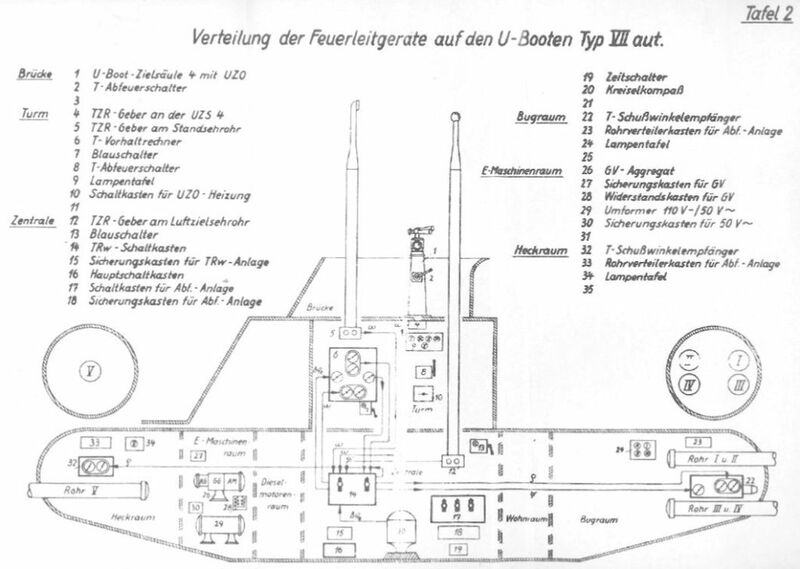 Torpedo launching was done after triggering the firing lever (Abfeuerschalter). 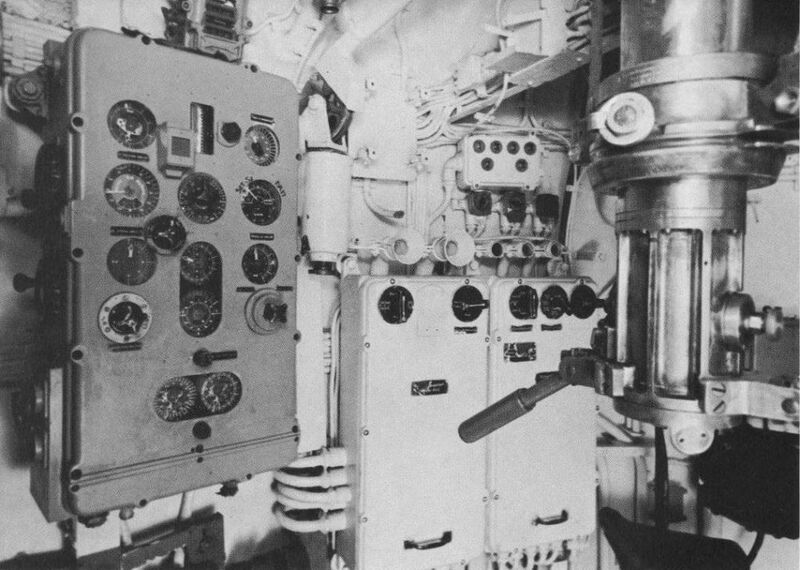 One such lever was located on the bridge, on the side of the UZO pedestal, while the other was in the conning tower near the torpedo data computer (left, below). 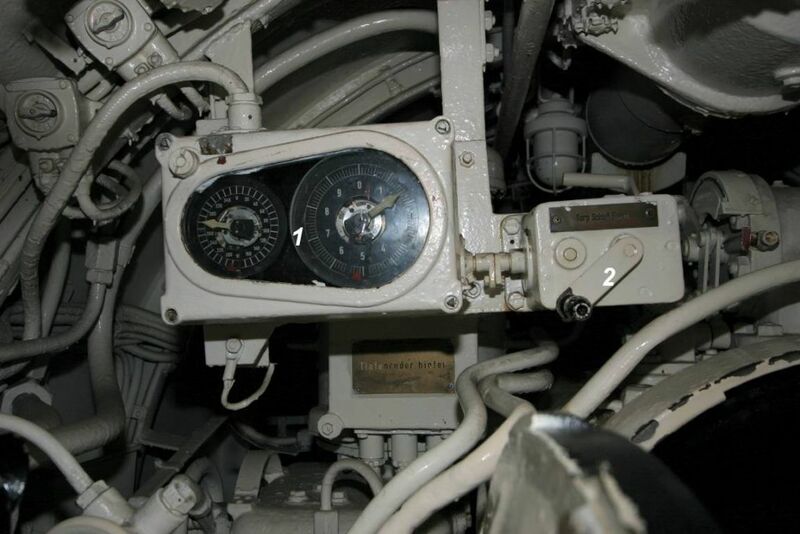 The active firing lever selection was done by means of the right hand rotary switch located on the torpedo firing subsystem control box front panel that was installed in the control room (under the chart table). 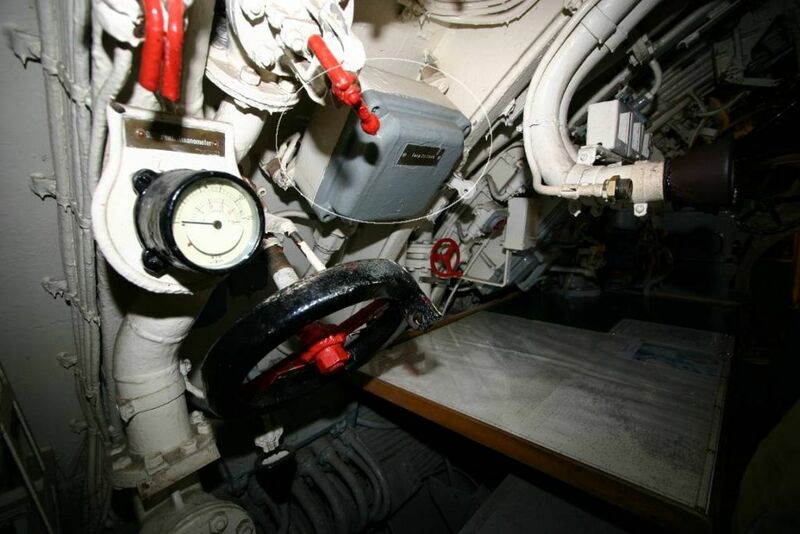 In the case of launching a salvo, at the moment of triggering the firing lever, the first torpedo was launched. Simultaneously the timing control box (Zeitschalter) was turned on, which launched the other torpedoes automatically at a 2-3 second interval (later changed to a slightly larger interval to keep the torpedo wakes from influencing the course of the other torpedoes). 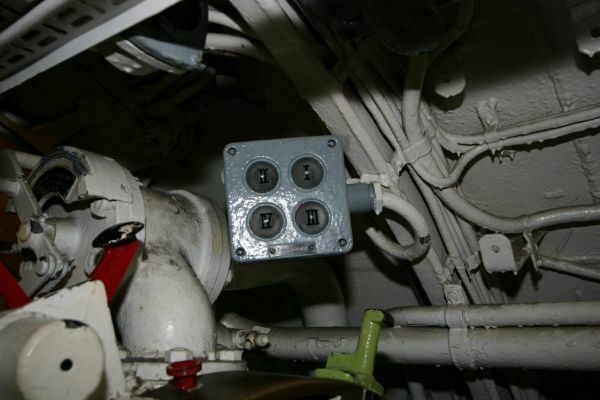 Simultaneously, the control lamp at the firing subsystem switch box lit-up – when it was lit-up (that is the whole salvo was not launched yet), none of the switches should be changed. 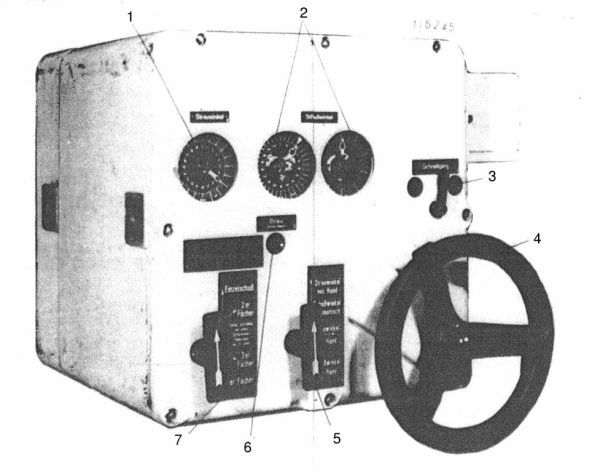 The timing control box generated the required delay between the launching of subsequent torpedoes by means of a simple spring-cam mechanism, triggered by an electro-magnet. The torpedoes left the tubes in the following order: I, III, II, IV. 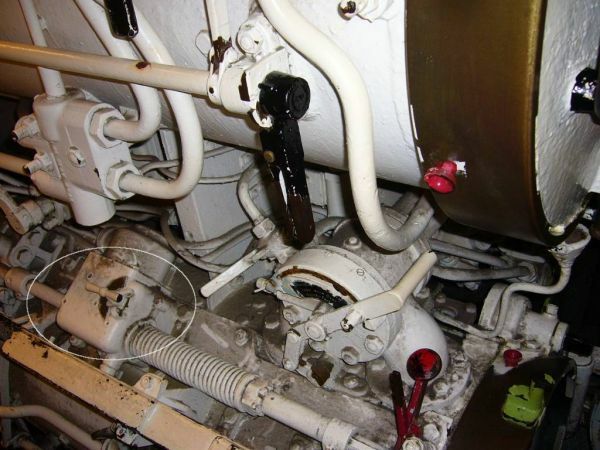 After triggering the firing lever, an electromagnet released the firing rod at the torpedo tube. 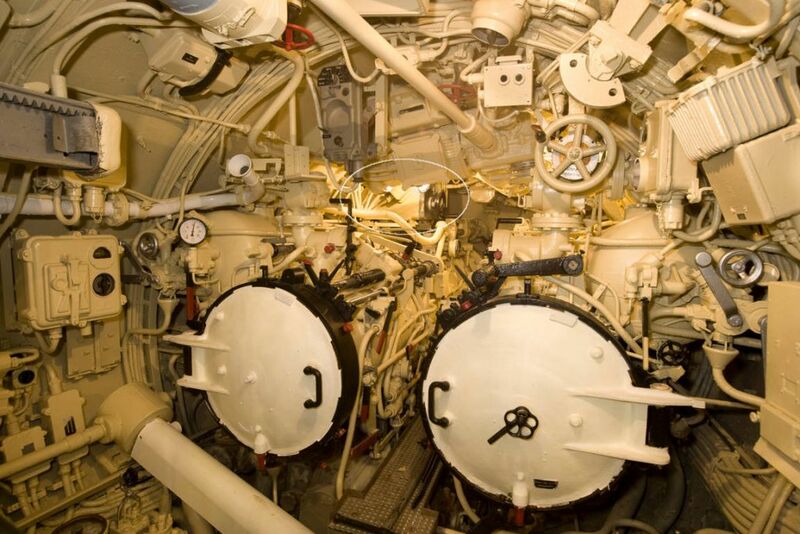 The torpedo firing subsystem contained control lamps which showed the state of the torpedo tubes. One box with control lamps (five lamps – one lamp for each tube) was located in the conning tower, the second (with four lamps) in the forward torpedo room and the third (with a single lamp) – in the aft torpedo room. 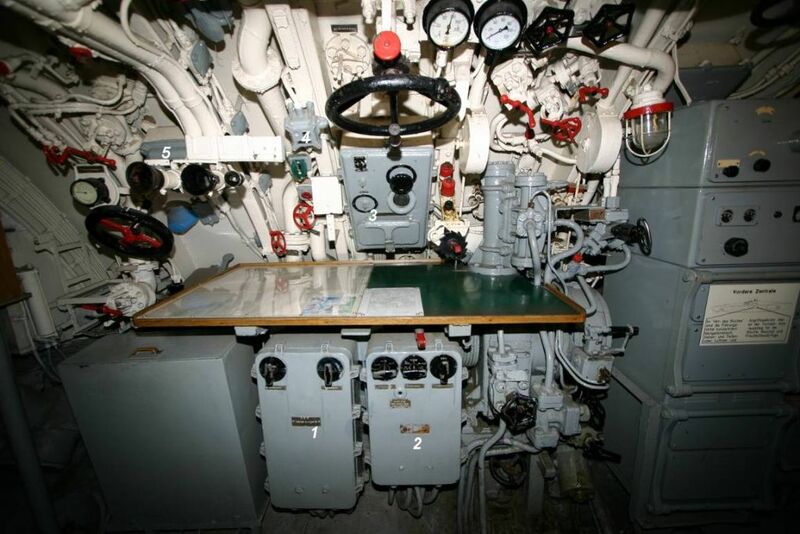 After selecting the desired tubes to fire (by means of the rotary switch on the torpedo firing subsystem control box), the respective lamps lighted up (each lamp was powered with low voltage so the light was dim). 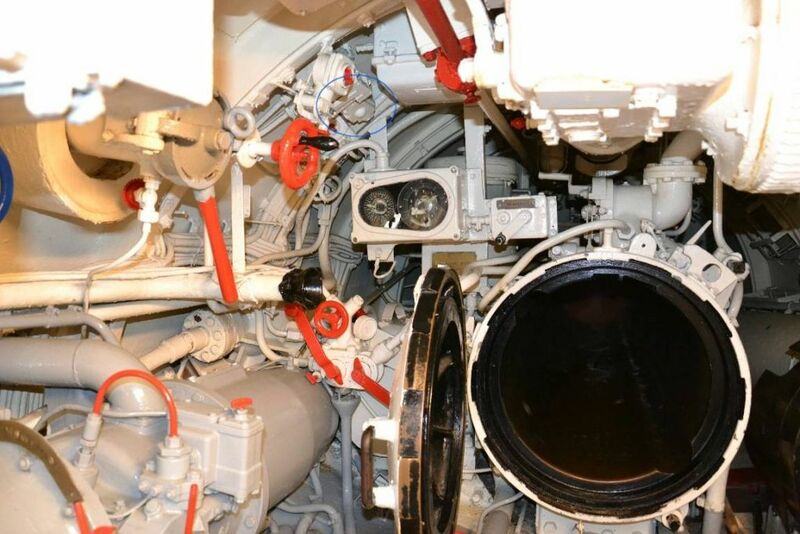 In such a state, it signalled the torpedo officer that the installation is operational and the tubes were selected properly. 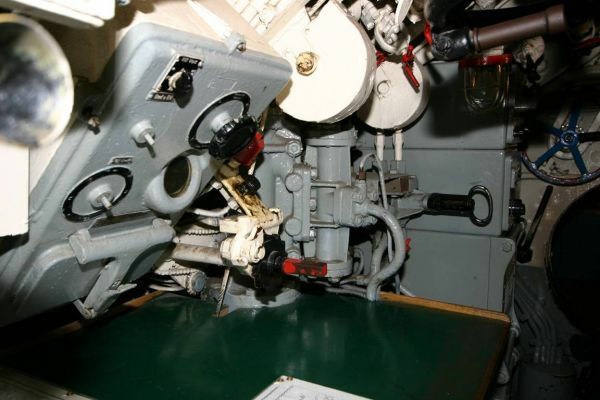 When the torpedo officer triggered the firing lever, the electromagnet released the firing rod. Simultaneously the control lamp of the corresponding tube became very bright. The tube operator in the torpedo room observed the lamps, and when he saw this he knew the torpedoes were being launched remotely. If the torpedo had not launched, then they launched the torpedoes manually. Thus the torpedo would always be fired – even if remote launching failed. 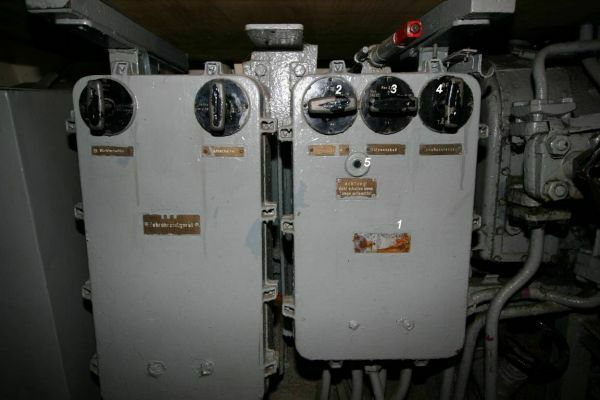 Another essential part of the aiming subsystem was the target follow-up switch (Blauschalter) located in the conning tower and control room. When it was turned off, the target bearings from the target bearing transmitter were transmitted to the TDC with the up-to-date calculated gyro angle. When the follow-up switch was on, the target bearing was not transmitted to the TDC and the periscope could be turned (i.e. to search the whole horizon) without fear that the gyro-angle gears in the torpedoes would be set to an incorrect value. Each switch was integrated with the control lamp. The similar lamp was located at the front panel of the TDC. The lamp lit up when the switch was turned on (the target bearing was not transmitted to the TDC). The described torpedo fire control system required two power supplies – the DC part (110 V) was powered from the ordering and reporting installation (B u M Gr 1c) through auxiliary switchboard 2 (in the control room), while the AC part (55 V, mainly selsyns) – by a rotary converter (TRw Umformer) located in the E-motor room which was in turn powered from auxiliary switchboard 1 (installed in the E-motor room). The main distribution box which held fuses and the controllers of the rotary converter and machine amplifier was located in the control room, over the chart table. 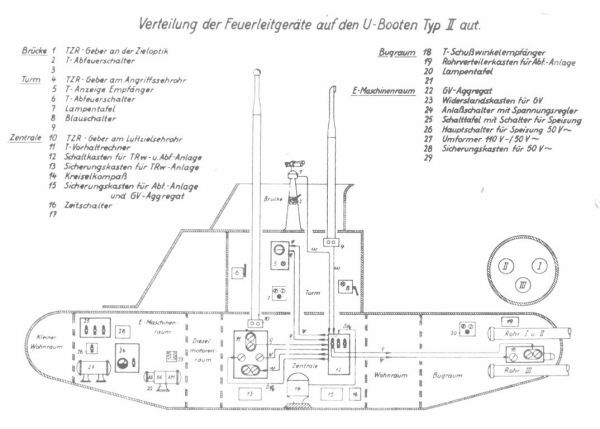 The other types of German U-Boats equipped with a different number of torpedo tubes (type II – 3 forward torpedo tubes, type IX – 4 forward torpedo tubes and 2 aft torpedo tubes, type XB – 2 aft torpedo tubes) were fitted with a torpedo fire control system built from the same parts. 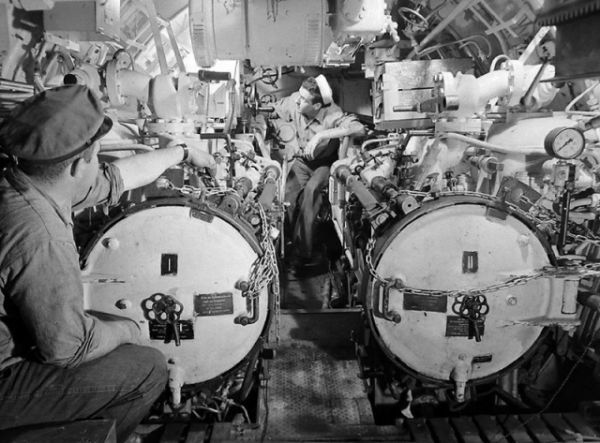 They differed mainly in the type of aft gyro angle receivers, which were adjusted to the number of the aft torpedo tubes (type VII – one tube, types IX and XB – two tubes), control lamp boxes (due to the different number of torpedo tubes), and location of the control boxes (in the conning towers of the larger boats and in the control room of type VII boats) and the TDC (in the control room of type II boats and in the conning towers of other types). A modification of the described torpedo fire control system was installed (intended to be temporary because an entirely new system was under development, but due to the war ending it was never finished) on the type XXI U-Boats. These boats were fitted with six bow torpedo tubes so a set of two receivers was used to enter the gyro angle – one standard receiver (with DC motor) driving the gyro angle gears of the four torpedoes (from I to IV) and one standard receiver for aft torpedo tubes of the type IX and XB U-Boats (with manual setting of the gyro angle and torpedo spread angle) for driving the gyro angle gears of the remaining two tubes (from V to VI). 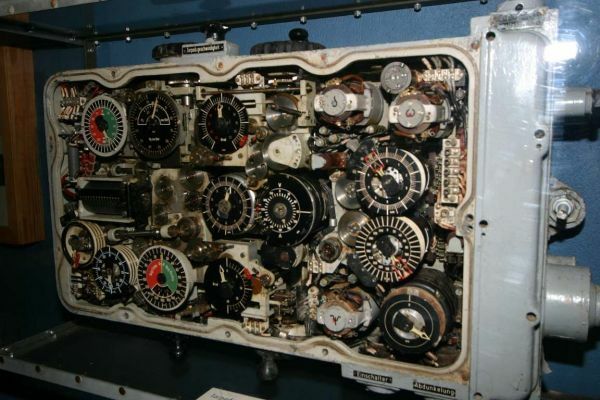 The torpedo data computer was installed in the conning tower. 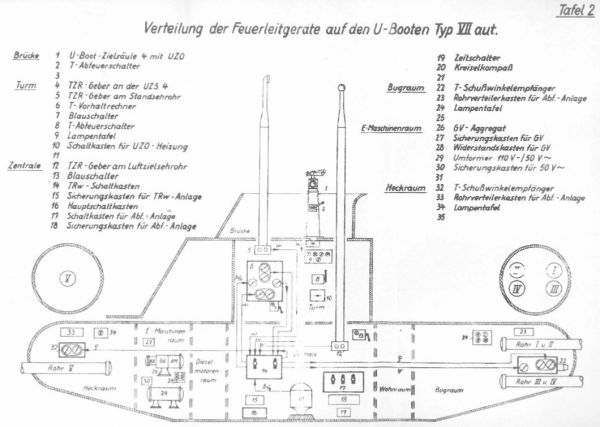 Demonstration showing the operation of the described torpedo control system is available here.